You are here: Home / Shop / Cat Stuff for Humans / Cat Gifts / Valentine’s Day Kitty Shopping at My Zazzle Store! 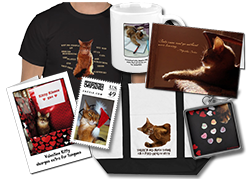 Valentine’s Day Kitty Shopping at My Zazzle Store! Coupons: 40% off my Kitty Candy Hearts Wrapped Canvas until midnight PT 1/25/13 with code CANVASPRNT13 and 15% off all items until midnight PT 1/25/13 with code HAPPYLOVEDAY! I am celebrating Valentine’s Day at my Zazzle shop with some really cool gift items! The design on the tile box above is also on an ornament, a keychain and even an 8″x8″ canvas! I also have Valentine mugs — this is just one of several designs! This is the other one! And yes, they are both on mugs too! And I even have a card featuring Binga, for all you tortie cat lovers! I have more items for sale there — go to my Valentine’s Day section and check them all out! OH MOL MOL! The “tongues” card is HILARIOUS!!!!! 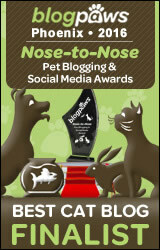 And Binga’s card is SO very pretty!!! Ohhh I wish you’d be my valentine, Miss Sparkle! Ha ha ha–extra for tongues!! Sparkle, you crack me up! I LOVE those cards even if I don’t have a Valentine. Oh noes..mom loves Binga’s…you know how she is…. We love your Valentines Sparkle! We’re glad Binga is on one too! Fantastic Valentine’s merchandise Sparkle! We love the kissing booth one! MOL! Love the kitty kisses card.